I stayed in Maharastra for couple of months to attend some training and got a chance to taste many Maharashtra delicacies. We, four of us myelf, Sruthi, Vishnu and Pushan would go together for lunch all the time of my stay there. Since Vishnu and Pushan are from North India and Sruthi was exposed to this cuisine already, they were familiar with all the north Indian foods and they introduced many foods that were totally new to me. Enjoyed everything and got to know the preparation of few foods. 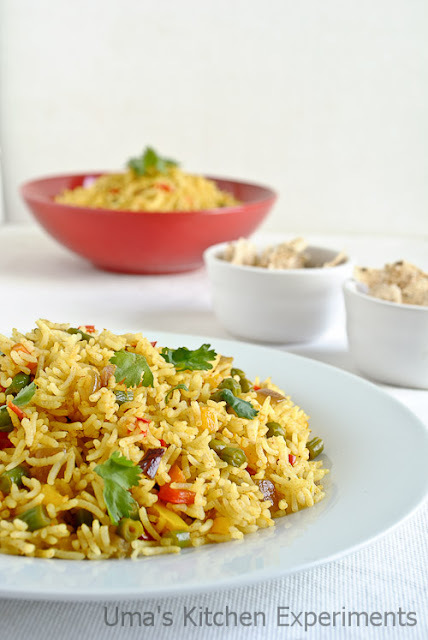 This tawa pulao is also one such dish that got introduced to me that time. After a hectic training, when we went to have lunch at our office, they closed the meals(Thali) section and only snacks and tiffin items were available. Since we all felt very hungry, we moved out to eat some meals. Also, we ran out of time to attend the next training session, quickly found one street side shop and got a plate of tawa pulao for each one of us. Don't remember how much I paid for it, but the quantity that was served was more and I felt completely satisfied as it was sufficient for my hunger. 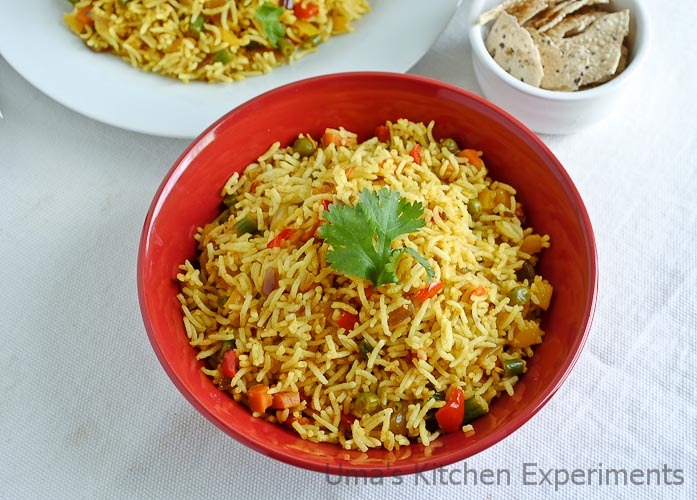 Days passes and when I started to cook food for myself, I thought of preparing this pulao many times, found the recipe and bookmarked this. The taste was almost similar to what I enjoyed from the street side shop. 1) Wash and soak the basmathi rice for 30 minutes. After 30 minutes, drain the water well and add it to pressure cooker along with 2 cups of water. Pressure cook it for 3 whistles. Once the steam suppresses, fluff it using a fork and keep aside. 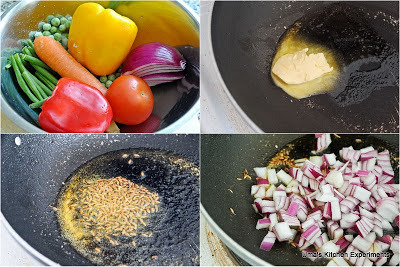 2) Take a kadai / wide frying pan. Heat butter in it. 3) Add cumin seeds and allow it to crackle. 4) Add onion and saute til it becomes soft but not brown. 5) Add minced ginger, garlic and green chilli to it. Saute till the raw smell of it goes off. Say about half minute. 6) Add tomato and saute till it becomes soft and mussy. 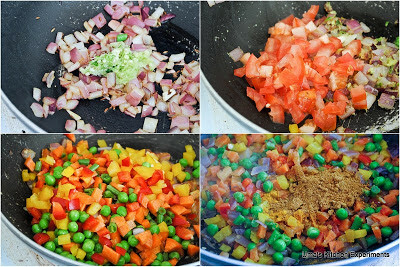 7) Add the chopped vegetables and salt. Reduce the flame to low. Sprinkle 1/4 cup of water. Cover and cook for 5 minutes. 8) Add red chilli powder, turmeric powder and Pav bhaji masala powder. Mix well. 9) Continue cooking till water evaporates. Make sure the vegetables are holding it shape and crispness even after cooking. 10) Add cooked rice and mix gently without breaking rice.Turn the flame off. 11) Squeeze out lemon juice and garnish with coriander leaves. 1) You can also steam vegetables in pressure cooker or microwave and use it for instant preparation. 2) It was garnished with finely chopped onion and coriander leaves and served with raita. 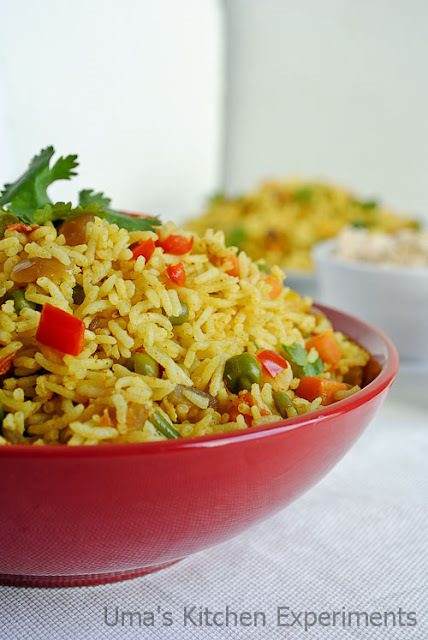 3) You can also use left over rice for preparing this pulao. 4) Add any vegetables of your choice. The colour of the puloa depends on the red chilli powder. I added it in very less quantity for mild hot taste. 5) Water quantity for rice might vary based on the Rice brand. So, follow the pack instructions for cooking rice. Picture perfect .. clicks.. n preperation n apt click with that paapad.. i love lijjat paapad.. Your pic tempts me to make it soon. Love the delicious rice plate, yummy and mouthwatering. never had tawa pulao before.. will give a try..
Pulao is delicious and mouthwatering. Looks very tempting n nice clicks!! I tried ur urad dal rice ,came out very well..taste very well with vatha kuzhampu..thxs uma!! I make so many varieties of pulaos Uma but this one remains a favorite all the time! Adding pav bhaji masala gives the perfect tangy, spicy n nice taste to the rice...tawa pulao looks so delicious n perfect...love it! wow..delicious and tempting .2&3 rd luks really cool. Never had this before will try soon!it looks too good! 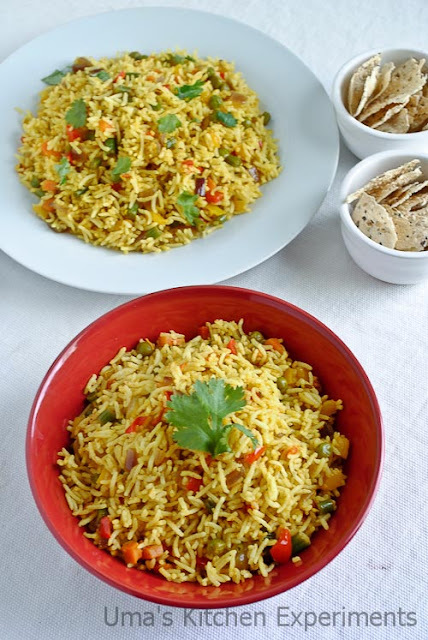 pulao looks delicious and flavorful. nice clicks.